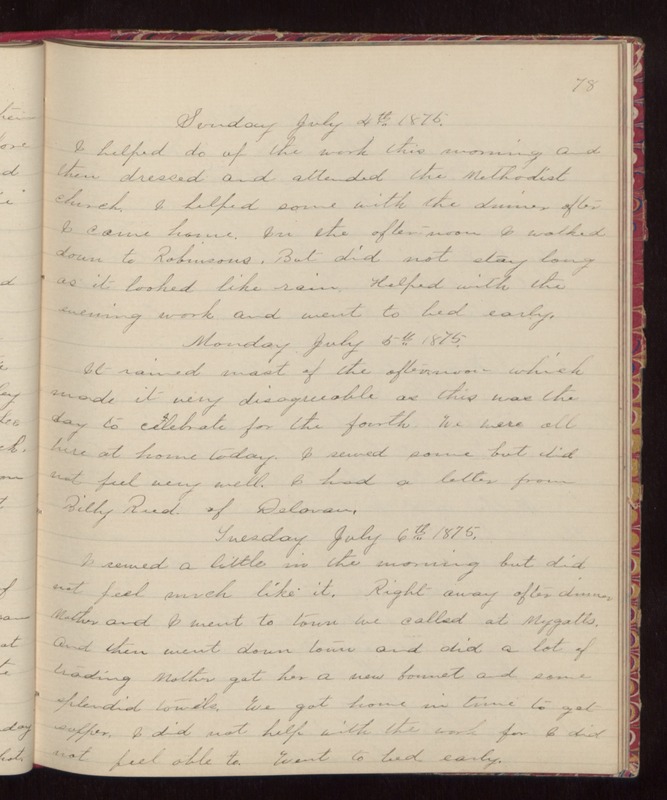 78 Sunday July 4th 1875. I helped do up the work this morning and then dressed and attended the Methodist church. I helped some with the dinner after I came home. In the afternoon I walked down to Robinsons. But did not stay long as it looked like rain. Helped with the evening work and went to bed early. Monday July 5th 1875. It rained most of the afternoon which made it very disagreeable as this was the day to celebrate for the fourth. We were all here at home today. I sewed some but did not feel very well. I had a letter from Billy Reed of Delavan. Tuesday July 6th 1875. I sewed a little in the morning but did not feel much like it. Right away after dinner Mother and I went to town We called at Mygatts, and then went down town and did a lot of trading Mother got her a new bonnet and some splendid towels. We got home in time to get supper. I did not help with the work for I did not feel able to. Went to bed early.